Nimble-Pedic Pillows are made from 5.3 Lb. 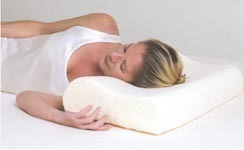 high quality, visco-elastic polyurethane foam, not unlike the well known Tempurpedic® Pillow. We utilized the highest quality memory foam we could acquire in today's market. The density of polyurethane foam has a direct bearing on the quality of the foam itself. To a point, the higher the density, the better the support! The design of the Nimble-Pedic Contour Pillow supports the curve created by your head, neck and shoulders to properly align your spine and give you a perfect night's sleep! Choose the thickness based on your shoulder dimensions and sleeping position preference (back or side) to promote an anatomically correct posture. A pillow that raises your head too high or allows it to fall too far back not only places stress on your neck, but also could inhibit breathing.